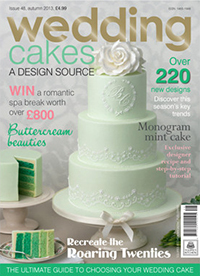 See my designs in the latest issue of Wedding Cakes – A Design Source! We require a minimum of 8 weeks notice for wedding cakes and 3 weeks for celebration cakes, favours, desserts and models. However we are only able to accommodate a limited number of orders each week, and demand is very high in summer months so please book early to avoid disappointment. 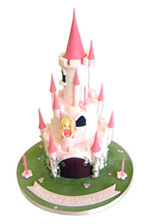 When we have recieved your deposit we will send out a reciept for that amount and the top copy of your cake order for you to check and keep for reference, along with a covering letter confirming delivery arrangements if required. The balance on wedding cakes and all other cakes to be delivered will be due 2 weeks before delivery , or on collection for celebration cakes.